Ottawa Magazine stops by to visit as Simon and Ross Fraser oversee the final weeks of renovations ahead of the opening of The Rowan, just steps from Lansdowne Park. Set to open in mid-July, the 45-seat restaurant, with its open kitchen and front-of-room bar, marks a new challenge for the brothers, who have operated Fraser Café, the so-very-popular neighbourhood eatery in New Edinburgh, for seven years. As the crews install lighting, Simon and Ross talk about the name, the menu, and the hoped-for vibe at The Rowan. You’ve operated Fraser Café [and, later, Table 40] for seven years. Why add another restaurant to your duties? Ross: We’ve always been on the lookout for new projects. So it was part of the plan. Now it’s time. Simon: It’s a great neighbourhood — The Glebe has a feeling very similar to where we are now [New Edinburgh / Rockcliffe Park]. So the neighbourhood seemed like a good fit for us and when the restaurant space became available it felt right. Also, I live just down the street in Old Ottawa South, so I’m close by! The Rowan marks a new challenge for Ross (left) and Simon Fraser, who have been at the helm of the successful Fraser Café in New Edinburgh for seven years. How did the collaboration [with Zazaza’s Ion Aimers] come about? Simon: It’s a long story, but we were working with Ion on new menu ideas for Zazaza [which has been replaced by The Rowan] and we ended up coming up with an idea for a whole new restaurant. It’s a huge change. Simon: It’s going to have a modern British feel to it — classic flavours. The food will be simple, flavourful, and local, with not too much manipulation. It will be very different from Fraser Café, which has more influences from around the world. But it won’t be pub food! Ross: There will be a familiarity to the dishes, but they won’t be exactly what you’re expecting. How did you choose The Rowan as the name? Ross: We had a few ideas and The Rowan won out. Since the food has an English feel to it, we wanted the name to match. The rowan tree is featured in many myths and stories. 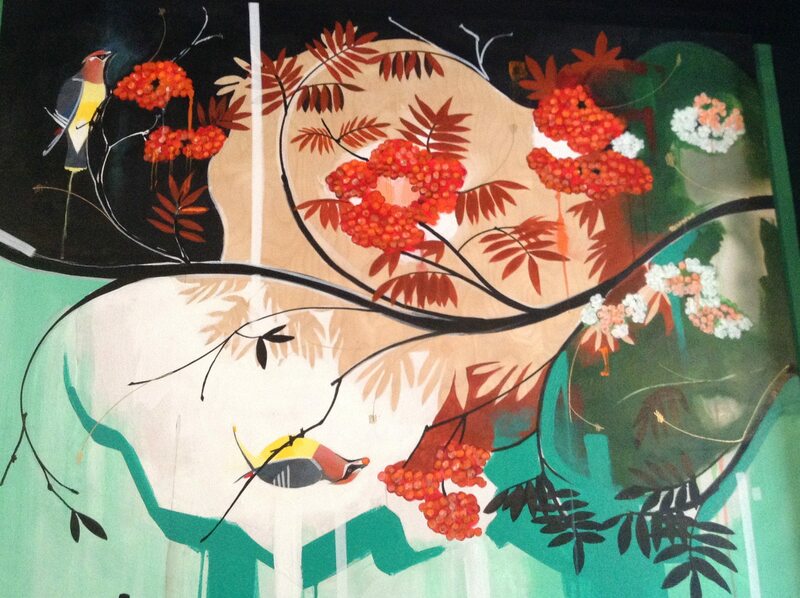 In one panel of the extended mural, the branches of the restaurant’s namesake rowan tree play host to colourful waxwings. Tell me about the mural of the rowan tree on one wall. Who did it? 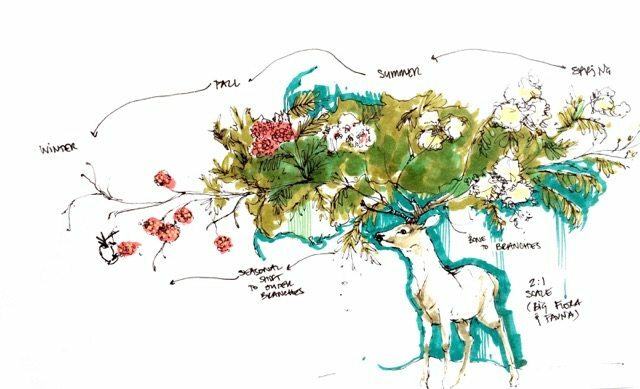 Ross: It’s actually done by one of the architects, Bex, from PLOTNONPLOT, which is the firm working on The Rowan’s design. Their team has been fantastic. They’re totally into design but also very practical. How many people will The Rowan seat? Ross: We’ve got 45 seats. There’s an open kitchen at the back and a bar with 6 or 7 seats at the front, where you can have a drink and also eat. How will you clone yourselves to work here? Simon: After all these years at Fraser Café, we have an amazing team, so we’re comfortable delegating to them. We know they can execute when we’re not able to be there. One of those team members is Kyle Deacon, who will become chef de cuisine at The Rowan when it opens. Ross: We’re pretty excited that this will be a very different challenge than the past seven years at Fraser Café. I’m sure we’ll see some familiar faces, but it’s mostly going to be a whole new neighbourhood crowd and a very different environment. Simon: Yes, at the café we have a similar crowd, more often than not. At The Rowan, I picture that there will be a different feel depending on what’s going on at Lansdowne Park that night. Is the opening date set? Ross: Early to mid-July. We have to get it right, so we’ll make sure everything’s ready before we open. Simon: We’ll post the opening date on social media once we’re sure.